Sympatex - CO2 Reduction - Your partner for innovative functional textiles. In its risk report 2016, the World Economic Forum classified global warming as the biggest existential risk for humankind with the highest probability of occurrence. We take these forecasts seriously, are aware of the mentioned risks and thus have decided to take action. We have succeeded already during the past years in significantly reducing our carbon footprint of the Sympatex membrane production. This means: the production of a Sympatex copolymer emits 50 times less CO2 compared with a PTFE polymer. In order to completely eliminate our contribution to global warming, we have further compensated the remaining CO2 amount which is annually emitted during membrane production with internationally certified climate protection projects together with ClimatePartner since 2017. The worldwide first climate-neutral membrane makes us a pioneer in sustainability again. Many of our customers have already joined us – together we also compensate the CO2 footprint of the respective textiles and even the entire piece of clothing or shoe. 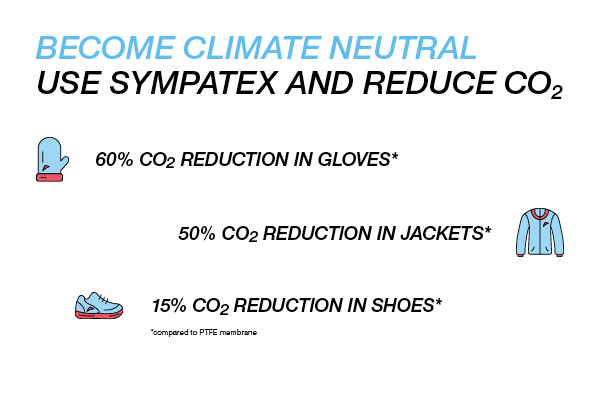 With this in mind, Sympatex illustrated through a representative outdoor clothing analysis that by itself, the selection of the membrane material has a decisive influence on the end product’s climate footprint. Furthermore, simply switching from a PTFE membrane to a climate-neutral Sympatex membrane, which has been available since 2017, reduces by half the amount of climate gases released into the atmosphere during the entire production process of an outdoor jacket – and for skiing gloves up to 60 percent. The textile industry is the 2nd dirtiest industry in the world – it is responsible for about 8% of all CO2 emissions worldwide (that’s more than all ship and air traffic combined or approximately as much as the entire EU). clothing generates 83% CO2, the shoe industry 17%. This amount will be doubled by 2030 if we don’t change anything. The UN is focusing these topics and has released the “Fashion Industry Climate Charter for Action” at COP24 in Poland. The charter contains a list of minimal targets which leading brands and many industry members along the supply chain have agreed on. 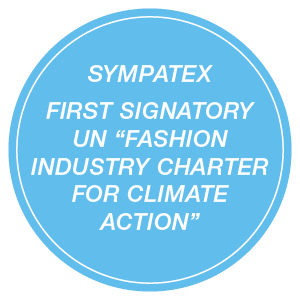 Sympatex is not only a signatory, but also actively participated in the development of the charter. We are convinced that many brands will follow this example and join the charter as well. The highest priority for Sympatex is to avoid CO2 emissions as much as possible. Therefore, Sympatex helps its customers to reduce their effects on the environment to an unavoidable minimum. With the help of the Eco-Calculator, the ecological footprint of each covered metre can be measured. Sympatex customers can now compensate the unavoidable CO2 emissions by supporting climate protection projects, and they will receive a certificate that can be attached to the label of the finished product with a QR code. Sympatex checks the complete process chain from the raw materials production to the delivery to our customers (“cradle to customer gate”).This lets the consumer follow the procedure, and the used CO2 is neutralised: a win-win situation for the company and the end consumer.